Located RTE 123 Directly Across the street from the Brockton City Hospital. Brockton H hospital signs and they lead you to our front door. And Never-Towed Parking Lots across street and next door in vacant lot. The Wizards Duel began in 1999 as a Magic the Gathering tournament held at the stores previous site called M Class Worlds located on Perkins Ave in Brockton Mass. M Class Worlds began as a comic book shop, which over the years transformed by popular demand into a tournament center featuring Local tournaments for Magic the Gathering, Pokemon, Yugioh, World of Warcraft, WWE RawDeal, Duelmasters and whatever else the players wanted. 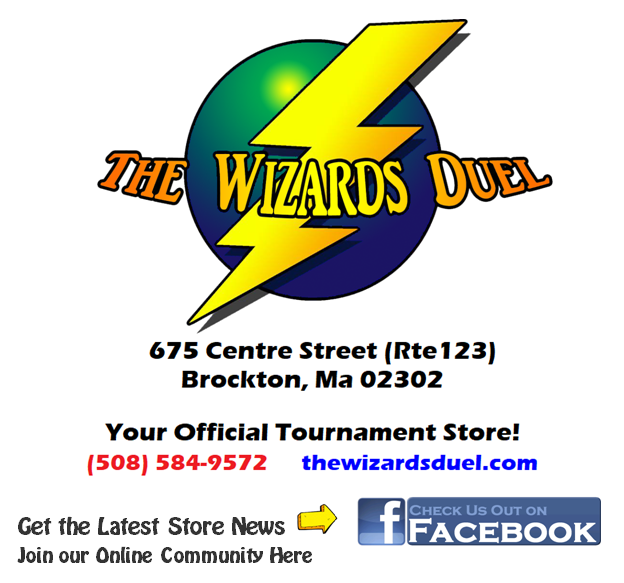 As popularity increased, an upgrade came and in 2001, The Wizards Duel became a full time gaming and collectibles shop located at 675 Centre Street, a main road Rte 123 right across the street from the Brockton City Hospital. By 2017, Dragon Ball Super has become real popular, tournament prizes include exclusive promos and packs only available at those events.